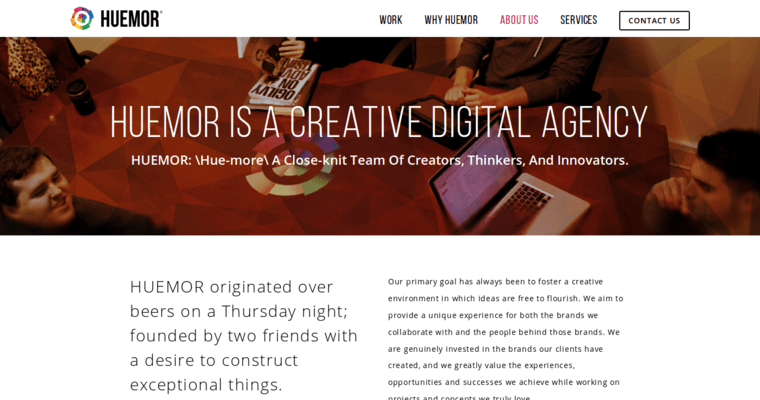 Huemor is a digital agency that excels in providing digital marketing solutions to businesses who require assistance with their marketing. Whether it is a product or service, Huemor has a team of experts who can strategize and plan a marketing concept that will attract customers to a website. Specializing in e-commerce development, content management systems, website development, creativity and design. They have the expertise to help various businesses define their goals and formulate a plan of action that will meet and achieve those goals. This is done through following a formulated plan of action that has been put in place via experience and numerous client interactions. The team at Huemor takes pride in their ability to solve marketing problems for businesses. They aren't just computer programmers, they have specialized web development skills that cover all areas of digital marketing. They can help improve an existing website or create one from scratch as well as work on a new product or service that requires unique branding.